'S e baile-iasgaich ann an ear-thuath na h-Alba a tha ann an Cala na Creige (Beurla: Stonehaven; Beurla Ghallda: Steenhive) neo Sròn na h-Aibhne. Tha e ann an Comhairle Shiorrachd Obar Dheathain (A' Mhaoirne ro 1975). Tha e mu 15 mìltean (24 km) san àird a deas air Obar Dheathain. Tha e suidhichte eadar dà beul-aibhne (Uisge Carrann agus Uisge Chollaidh) agus air cladach Bàgh Chala na Creige. Ann an 2001 bha 9,577 duine a' fuireach an seo. Tha e na laighe faisg air an A90. Tha Stèisean Chala na Creige ann, far a bheil na treanaichean a' ruith gu Obar Dheathain agus Dùn Dèagh. 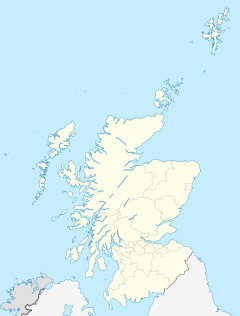 Air a tharraing à "https://gd.wikipedia.org/w/index.php?title=Cala_na_Creige&oldid=495761"
Chaidh an duilleag seo a dheasachadh 12 dhen Ghiblean 2015 aig 12:43 turas mu dheireadh.